Just like all human endeavors, the audio hobby is a mental state and a psychological affair. I have always wondered if I would be a happier person were I to have remained single with a bare living room but a killer sound system and all the time in the world to listen to music through it. And without commenting on the various situations in which I wished I had remained single, and the rampant thought that all married men will contemplate sooner or later, I’ve always fathomed the degree of change one would have on the perception of his world when he became enfolded into the bubble of happiness that is music envelopment days in and out. That is until you walk out the door and see this lovely woman you have been missing, and the state of mind changes and you want a companion. Suddenly, everything you have is in her way. The $90,000-the-pair SET 100 hybrid monoblock amplifiers are the source of my musical ecstasy. 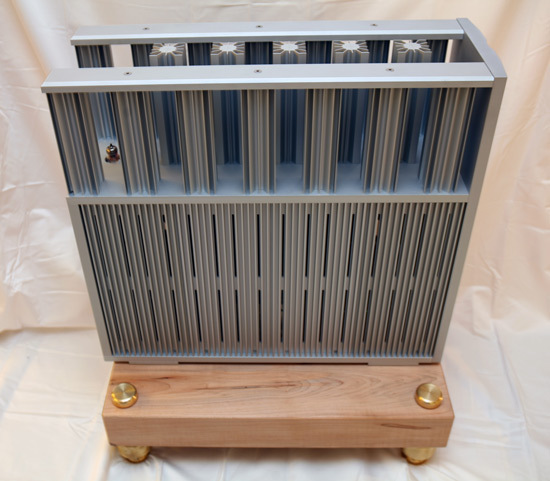 It makes use of an NOS 5842 type high-gain single triode input stage with tube rectification, a single-ended MOSFET output stage facilitated by 16 matched (2% tolerance) parallel MOSFETs operating in class A with constant bias, thereby effectuating a 2-stage single-ended triode output topology. Oversized power supply chokes with a bandwidth of 5 to 1MHz (-3dB) are used on both gain stages for the DC load, therefore effectively negating any active device in signal path. The tube stage is directly coupled to the output MOSFETs. The Ypsilon SET 100 is also unique in utilizing 6 transformers for the various critical functions. According to Ypsilon, the in-house designed and manufactured 1.2KVA power supply transformer was given an M6-grain oriented core material used normally by output transformers, so as to realize the lowest level in EMI. Twenty 4,700µf high-temperature capacitors are employed to eradicate power supply output ripples. Then, a choke-complimented power supply is allocated just for the input tube, plus a signal transformer at the input stage and a 66lb transformer of proprietary amorphous double C-core for the output stage. The YE website contains a page on the decision process it went through in adopting the hybrid approach. The YE approach is unique in that a single-ended MOSFET output stage is chosen, instead of a class A/B one implemented by many other companies to produce maximum outputs of several hundred watts per channel. The company’s is the most fanatical approach in that it did not subject the creation of its ultimate monoblock amplifier to inhibiting limitations of a standard chassis design; it was as if the gargantuan external dimensions of the monoblock only took form after the types of internal components and circuitry needed to facilitate a 100 watts-plus output were defined. The end result is a wonder of sorts at least on paper: The most powerful SET in existence capable of 120 watts into 8 ohms, 130 watts into 5 and 6 ohms, 100 into 4 ohms, yet with the stability and output impedance of a solid-state design. Thus, the name SET 100 refers not to a tube amplifier but a solid-state, high output design that operates with the circuit topology, elements and characteristics of an SET. Measuring 24 inches high by 26.5 inches deep, the SET 100 is only 9.5 inches wide, the construct serving the very blatant function of deprivation of freedom on the part of its owner to put it in a rack. The designer’s motive becomes clear as day once you realize the two monoblocks’ heat dissipation needs. Solid-state they are, the SET 100 is constantly biased at 350 watts regardless of signal changes, producing a working temperature of 50̊ to 55̊ Celcius. Nonetheless, the Ypsilon is just as hot as any tube amplifier that can manage to put out 120 watts from a dozen 300Bs, or half a dozen 211s, if not hotter. In my 12 feet wide by 27 feet long by 8 feet high listening room, the $29.5k Red Rock Renaissance monoblock amplifiers that I reviewed in October 2008, slightly higher at 26.75 inches but not as deep at 17.5 inches, and just about as wide at 9.25 inches, already produced considerable heat after an hour or two in operation, but still not to the extent of the Ypsilon. The likelihood of the Greeks being put into a standard rack, were they of more standard dimensions, would be very high and the likelihood of thermal damage imminent. It seems reasonable to assume the readers among us who can afford the Ypsilons are likely to have much larger listening room with central AC already installed, thus rendering my heat predicament moot, although I couldn’t turn on my central AC because it was spring and only hot in the listening room while the rest of the house was at least 10 degrees cooler. Brian Ackerman of Aaudio Imports never heard the Ypsilons in his own system, for the monoblocks were shipped to me brand new directly from Greece. They would not be taken out of the customized flight cases until Brian’s arrival at my house a few weeks later. Weighing in at 198 pounds each, the SET 100s were eventually taken out of their case and each was put onto an extra-length Mapleshade Amp Stand. Special Mapleshade brass cones were also strategically positioned between the SET 100 and the stand, as well as between the stand and the carpet underneath. Auditioning of the SET 100 involved my digital front-end of the 47Lab PiTracer CD transport and the Audio Note DAC5 Special, the preamplification of Pass Labs X0.2 and the Rockport Mira Grand II loudspeakers. Wireworld’s Platinum Eclipse Reference XLR ran between the DAC and the preamp; as for connecting the preamp to the SET 100, since the power amp’s topology was single-ended, the Audio Note SOGON™ silver RCA interconnects linked the preamp with the Ypsilon. Acapella’s La Musika Reference loudspeaker cable, which I reviewed last month, served as the reference loudspeaker cable. The Rockports were 90dB sensitive at 4 ohms, and with two 10-inch woofers, two 5.25-inch midrange on top of the 1-inch Ring Radiator tweeter. The specified sensitivity implied an already highly efficient crossover network. Whether the minimal amplifier estimate that Rockport puts forth is based on solid-state or tube amplification, or both, it wouldn’t be based on the use of SET amplifiers. For no SET designs could generate nearly as much power. The Pass Labs XA100.5 monoblocks outputs 100 watts into 8 ohms, and it is of single-ended topology with 2 gain stages, while the Red Rock Renaissance monoblocks are capable of 50 watts per channel, but they are parallel in push-pull in operation. Whereas the Pass Labs were conjuring up the most authoritative bottom-end and a sparkling tonal presence from the Mira Grand II, the Red Rock amassed the most extended spectral behavior among tube amplification while eclipsing the Pass Labs with their tube-endowed midrange glow. Although the Greek monoblocks couldn’t pump out 200 watts into 4 ohms like the Pass Labs, they were driving a pair of speakers only twelve feet away from the listening position, under an 8-foot ceiling and a 12-foot wide room. In this setting, the Ypsilon’s 100 watts was more than enough for the 90dB speaker. Playing the Scherzo of Bruckner’s Symphony No. 9 (Sony Classical SMK 64483), beginning with its insistent yet humble pizzicato inquisition that led to a glorious full orchestral proclamation, the concurrent sustenance of dynamics and dimensionality displayed was superior to what the solid-state Pass Labs or the tube Red Rock were both capable of producing. While the observed dynamics was clearly a strength reminiscent of the Pass Labs, the tonal delicacy and sophisticated shading personality was definitely that of an SET. For I heard a pristine tonality not available even from the Red Rock, and yet more extended in scope than what I experienced from the Audio Note ONGAKU and AN-SEC Silver setup of a few years back. But now it was a pair of 90dB/4-ohm Rockport, and the Ypsilon’s 100 watts offered not only assurance unobtainable in SETs, it was of the SET topology through and through. The sheer power of the SET 100’s solid-state output stage was at once evident in its concoction of the trio of taikos in track 5 of the JVC XRCD2 Dotou Banri. Whereas the Pass Labs monoblocks propelled the Rockport into providing the most assertive and realistic rendition of the scale and tonality of the instrument in solid-state amplification, on top of a cunning recreation of the venue, the Ypsilons placed the performance on a much grander scale. The music attained a much richer definition in tonal shading, amidst more densely populated performance cues and force. While the Pass Labs prompted the Rockport into launching a precise and realistically formed sound wave towards me, the Ypsilon welded the Rockport’s separate elements into one concerted being with deeper tones and richer sensations. Subjectively, the Ypsilon rendered deeper, more powerful and realistic sonic experience. In spite of the above, there were weeks when I was entrenched in the Ypsilon’s control of the Rockport in recreating the venue of chamber music. There was magic in how individual pieces in a string or piano quartet were rendered by an SET amplifier with high-efficiency speakers, such as what many termed as “the golden tone” of instruments. No exception here, what with the Ypsilon’s SET core compelling the Rockport to an altogether, otherworldly music experience I never heard from a 90dB loudspeaker. In full glory was the occasional wild abandonment in Beethoven’s String Quartet in C sharp minor op. 131 (Deutsche Grammophon DG 463 579-2), which for the first time carried such distilled layers of string tone as to render all previous non-Ypsilon listening impressions comparatively pointless. Thus, the power of Beethoven was exemplified by the Ypsilon for the first time even in chamber music, in the “Adagio quasi un poco andante” and the connecting last movement, the “Allegro”, where together the tenderness in the composer’s psyche was depicted as meticulously woven in the backdrop of his unyielding insistence of a self-governing fate in the last movement. I had not heard such penetrating sounds from a disc I’ve owned for five years, and I am mortified that I may not hear the disc under such finesse again. In my aforementioned Ypsilon/Rockport-induced chamber music days, also laying siege to the Ypsilon induced playback was an incredibly 3-dimensional bodies of instrument, fully resplendent in depicting the contrasting variance in individual soloists’ playing amidst the unified whole, such as in the Brahms Klavierquartett op. 25 (289 463 700-2), or the wondrously sonorous string quartet in the Beethoven disc, or the most majestic and noble Richard Strauss Sonatinas (DG 445 849-2). In the midst of all this first-class performance was a breadth and scope never realized in manners close to what the Ypsilon had fostered in the Rockport. Right there behind and above the most immediate wave of sonic dispersion was a much larger and denser dimension of spatial and tonal richness as forged by the Ypsilon/Rockport. The effect was such that a liveliness pervaded the listening space, and where the eyes would deny the event, the depth of dimensionality and thickness in spatiality continued to overwhelm the consciousness. Playing the Winston Ma crown production of the redbook K2 HD sampler This Is K2 HD Sound!, the most enveloping and spine-tingling atmosphere permeated the physical world. Whether it was the soul-melting “Kinderpiele”, or the expensive-sounding “Vivaldi Four Seasons” with the1722 Petro Guarnei violin, or the hugely atmospheric and incredibly audiophile “Zapataedo Excerpt”, the Ypsilon-driven Rockport projected the most definitive audiophile experience in its realism and surrealism. The “Zapataedo Excerpt” track, most especially, redefined the concept of an audio trans-dimensional experience. If instrument realism has always been your goal, try the floor-tapping effects on this track! The Ypsilon transformed the Rockport’s behavior and in doing so, creating a sonic fabric that not even the folks at Rockport would have anticipated. The experience of listening to the Ypsilon constituted a re-education of my audio perspective. For there wasn’t much indication of a solid-state circuitry at work except when the sheer driving power began to exert its dominance over the Rockport that I felt dumbfounded and remembered I was listening to the only muscular SET-based solid-state amplification in the world. The greatest of soloist performs like no other, for his brain is wired in such a way that his left and right hands are seemingly operating on a mind of its own, and the soloist himself plays with no inhibition or anxiety for hand/eye coordination, or the concern for pitch correctness, or whatever. The instrument is a piece of cake to him, and he will tackle and overcome any composition deemed insurmountable to his fellow musicians with superhuman ease and intensity. We are drawn to such music making, for in our very own brain is the ability to recognize natural, free music making in its most complex form. I felt the conflict within me when auditioning the Ypsilon, whereas my left brain could not comprehend the impossible, my right brain was thoroughly submerged in the bliss that was the Ypsilon sound. This new sonic characteristic, one that was SET at the core and solid-state in flesh, presented a conundrum to my psyche. The categorizing of amplification design based on topology, a system that has served our need for proper system matching so effectively and was imbedded into our audiophile psyche so irreversibly, suddenly didn’t apply anymore. No longer are we given a love/hate choice of solid-state and vacuum tube, or of high-output solid-state versus low-output single-ended triode, or even of accuracy versus euphony. It is no longer of any consequence whether you are an SET aficionado or not, or if your beloved loudspeakers are efficient enough for SET amplification. With the Ypsilon SET 100, music via single-ended triode is the ultimate endgame – the solid-state output stage is merely a means. The ends, in this case, justifies the means, and the unorthodox presentation of the Ypsilon SET topology in the most muscular implementation to date signifies a most worthy new turn in our pursuit of audio nirvana. Furthermore, my previous SET reference, the Harmonix Reimyo PAT-777, pumped out seven glorious watts that sounded as powerful as fifteen and more, especially when driving the 95dB Audio Note AN-E SEC Silver, and what bliss that sound was. But companies that produced comparably efficient speakers with superior resolution, tonality and overall performance were far and few in between, with horn-based design dominating the marketplace predominantly. If you are not fond of horn speakers, you are out of luck, and have to resort to high-output solid-state amplifications for your inefficient speakers. In addition, a very notable few vacuum tube companies have endeavored to bring relatively high-output SETs to the market without achieving major inroads into audiophiledom. Then, there is the Pass Labs XA.5 series of amplifiers that comes closest to realizing the complex tonal shading and the mitigating top-ends of SETs, and come packed with vanquishing muscles. For their asking price, the Pass Labs are the best investment in amplifications, and they have no peers. The Ypsilon SET 100, however, is most easily and readily appreciated by the reader who learned about the pros and cons of solid-state versus SET the hard way, that is, by having user experience in both. Because to most audiophiles, the Ypsilon will appear as another tube-input, solid-state output amplifier that is astronomically priced. But for those of us who have chosen to stay the SET course, at least in principle, we have been struggling with loudspeaker choice limitations all our lives. Until now. Now, for the privileged few who can afford the Ypsilon SET 100, with the attendant listening space and a central AC, the Ypsilon represents the ultimate SET solution that will not only show you what your horn speakers can do with 100 SET watts, but it will also free the rest of us from the meager lineup of high-efficiency loudspeakers. Only then will the SET 100’s virtues be fully appreciated.